استیسی کیچ (اینگیلیسجه: Stacy Keach) آمریکالی اوْیونچو. آمریکادا دۆنیایا گؤز آچیب. 1964 The Colleague Episode: "The Face in the Sun"
1971 Wilbur Wright Episode: "The Wright Brothers"
Politician Episode: "Crossing Fox River"
1977 Barabbas Miniseries; episode: "Part 2"
1978 Unnamed character Episode: "The New Fitzpatrick"
Man in Cold As Ice Episode: "Christopher Lee/Meatloaf"
1997 Ned Bernhart Episode: "Downsized"
1999 Vance (voice) Episode: "Lost Soul"
Cord van Owen Episode: "The Gun"
Roland de Flores (voice) Episode: "The Next Gun"
Harold Falcon Episode: "Book of Virtues"
2005 Blaine McNamara Episode: "George Stare-oids Down Jason"
Wendell Schacter Episode: "From Queer to Eternity"
Skipper (voice) Episode: "Air Mater"
Himself Episode: "Murphy Brown Lied to Us"
Ray Episode: "Charlie and Deception Therapy"
Jimmy Brogan Episode: "Old School"
2014 Orion Bauer Episode: "American Disgrace"
Bill Drake Episode: "An Officer and a Dental Man"
↑ American Greed: "Anything For Money". YouTube (2012-11-07). یوْخلانیلیب2013-02-22. ↑ American Disgrace. IMDb (October 1, 2014). یوْخلانیلیبMay 28, 2017. 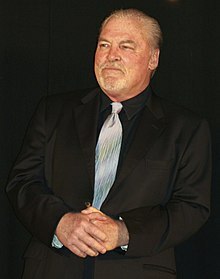 اینگیلیسجه ویکی‌پدیاسی‌نین ایشلدنلری طرفیندن یارانمیش«Stacy Keach»، مقاله‌سیندن گؤتورولوبدور. ( ۲۲ ژانویه ۲۰۱۸ تاریخینده یوْخلانیلیبدیر). قارداش پروژه‌لرده استیسی کیچ گؤره داها آرتیق بیلگی‌لر تاپابیلرسینیز.